All right, so funny story. When I started college in 2004, I met a girl online who happened to be going to the same university as I. We decided to meet and in the summer of 2005 we started having sewing days. That is when I started this project. 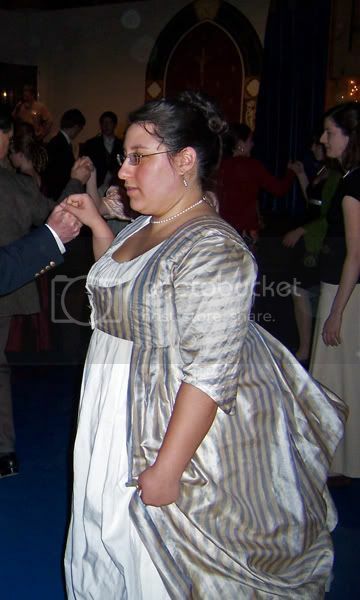 Gwendolyn is a big fan of the Regency period and since we actually met on a Regency (ish) costuming community, it made sense that the first thing I would work on in her acquaintance would be a Regency ensemble. I started from the ground up with a pair of stays. 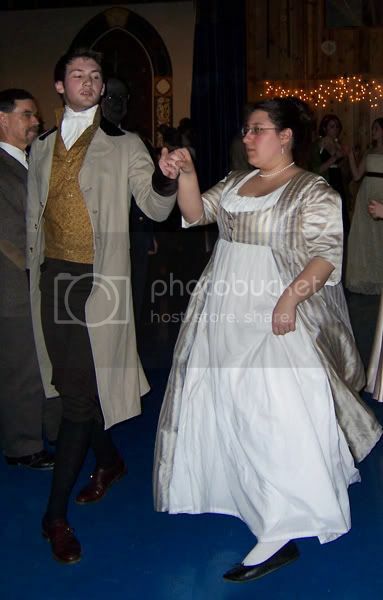 Even funnier story--I've been making historical costumes since 2005 and I have yet to make myself a chemise. I think that officially makes me a hack. The stays are made of cotton duck and Wright's poly/cotton bias tape. They're boned with industrial cable ties, some of which are too long and leave bruises on my thighs after several hours in costume. Over the stays and tank top *ahem* chemise goes a bodiced petticoat of Southern Belle cotton. Jo Ann Fabrics used to sell this, a tightly-woven cotton with a crisp hand that was absolute murder on the hands when sewing, but great for undergarments because its tight weave lent opacity to the fabric and the crisp hand made it somewhat structural. I can no longer find it at my local Crappy JoAnn, and it makes me sad. The dress itself is of white cotton lawn from Dharma Trading Company and I am still completely in love with it after all these years of...um, not wearing it. The same cotton lawn (leftover from this project) was used to make a chemise for Holly's Victorian undies. This is, sadly, is the only picture I have of the finished dress. 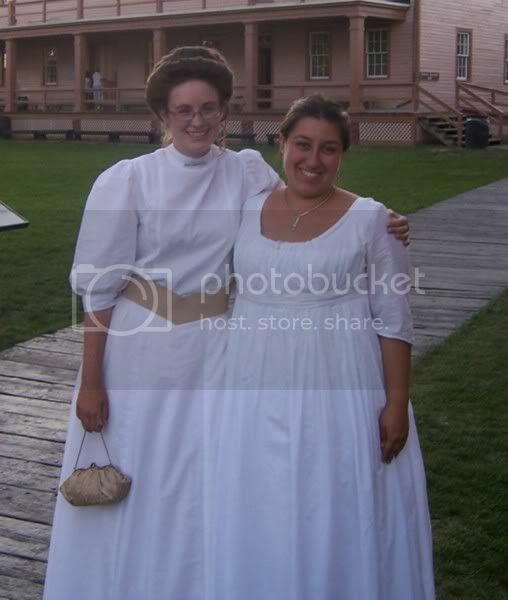 This was taken summer 2006 at Fort Mackinac on Mackinac Island after the MSHP awards ceremony. Technically, the occasion was "casual attire," but Julie and I are just a little bit crazy so we did period-casual, not modern-casual. And did I ever mention that I may have a slight obsession with sheer white dresses? Well, I do. Hence, what you see above. I believe I purchased the fabric for the pelisse (overgown of sorts) at roughly the same time as I started the project. I then promptly screwed up when patterning the pelisse and chucked the whole thing in a corner for a while. Also, I want to say that the silly thing was actually finished in 2006 and it just took me that long to find a reason to wear it in public. In fact, I'm almost certain that's exactly what happened. I fixed the bodice patterning and sewed the sleeves on in the early months of 2006 (by hand--my sewing machine kept trying to eat the silk tissue), hemmed it over the summer...and then never wore it. Until January 2008. Fail! To make up for it, though, I have lots of photos. 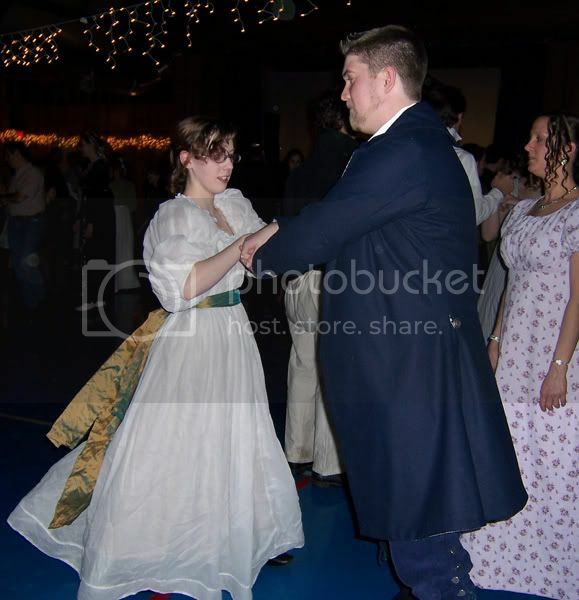 The Ann Arbor Council for Traditional Music and Dance hosted a ball in January of 2008. Julie said, "You should all come!" I said, "Okay!" since I already had an outfit. 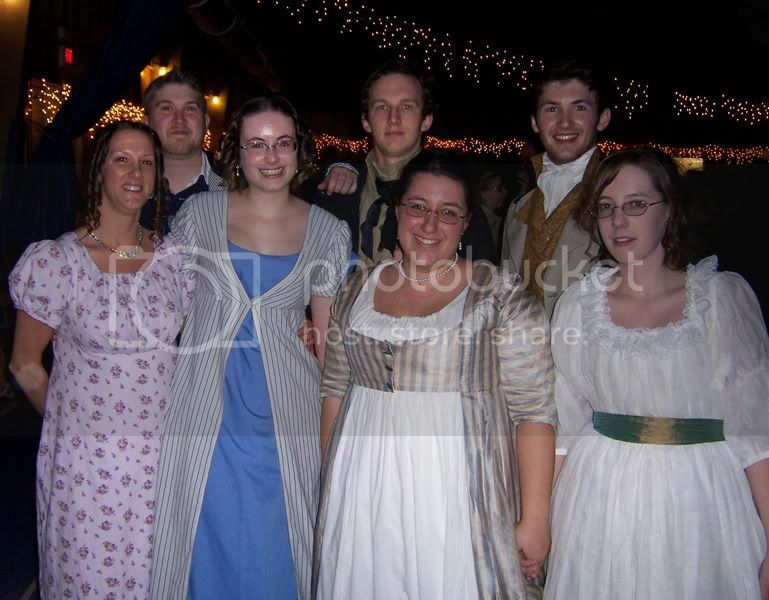 That meant I could spend most of January making a 1770s coat and a chemise dress for other people in our group. The pelisse has a little tiny train on it, which isn't really a problem when I'm just walking around. It lasted about thirty seconds into my first dance, however, until I produced a straight pin from somewhere on my person and asked Julie to make it so I wouldn't be killed by my own dress at some point during the evening. I'm responsible for the two dresses on the right (mine and Gwendolyn's), Julie (immediately to the left of me) is responsible for hers and the pink one on the end.